What Does Hail Damage Really Look Like? The biggest misconceptions about hail damage is that it will be obvious. You’ll see branches down, leaves all over your lawn, dings in your car and hail marks all over your roof, siding and window screens. The reality is, most of the time hail storms leave very little trace. In our 25-years in business, we have only seen one storm decimate a neighborhood the way most folks envision the aftermath of a hailstorm to look and that storm was historic. The discrepancy between the perceived aftermath and the true aftermath leaves most homeowners feeling unscathed and damage free when that may not be the case. 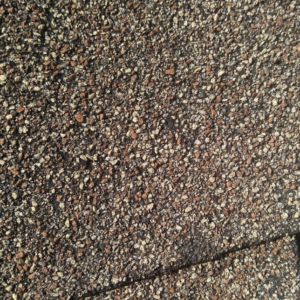 The photo above shows the pretty anti-climatic reality of hail damage to shingles. Hail hits are small and very difficult to see in good lighting and nearly impossible to see from the ground. Even more amazing is this mark was caused by significant hail, not tiny pea sized hail that melts on contact. This scuff was created by golf ball sized hail. Without knowing what to look for, most homeowners wouldn’t even point this mark out, shrugging it off as normal wear and tear. 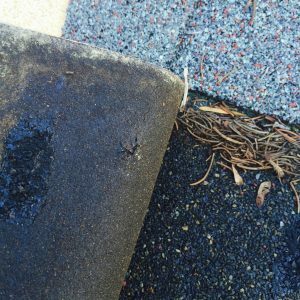 Don’t get the wrong impression, these seemingly harmless scuff marks are extremely detrimental to your shingles. In fact, this homeowner’s insurance company approved their hail damage claim and paid for the entire roof. Insurance companies do this because they know it is more efficient to replace the roof than have to cover major leaks later, which is what hail damage creates when left unfixed. These marks are really signs of where hail balls decimated the granules on the shingle. Over time, the surrounding granules become looser and more begin to come off. 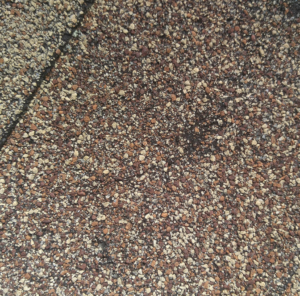 The granules are the protective top layer of your shingle so the less you have, the weaker the shingle. Over a few months time, with rain and wind and snow, the area where the hail bail hit begins to rip. At this stage, your shingle is no longer preventing water from entering the underside of your shingle and your roof is not shedding water but instead, taking it in. This is how interior leaks happen and by this point, you are probably outside of your time frame to file a hail insurance claim. There is nothing you can do to stop a hail storm from hitting your home but what you can do is be proactive after one does occur. Watch the news, most hail storms large enough to cause damage are reported. Maybe you weren’t home or maybe it was overnight and you are unaware one even hit your area. After you suspect your home may have been in the storm’s radius, call a certified Haag inspector to look over your roof. Here at Modern, we don’t charge anything for an inspection and we’re also happy to answer any questions you have about damage or the insurance process. Contact us today to schedule your inspection!